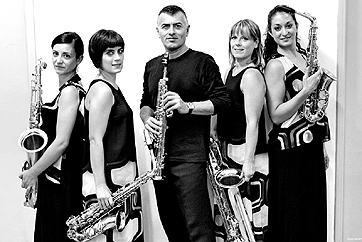 Silvio Zalambani Amerindia Ensemble is the meeting of a soloist soprano saxophone and a female saxophone quartet, where the union of polirythms and jazz improvisations and engaging atmosphere in a form of chamber music. 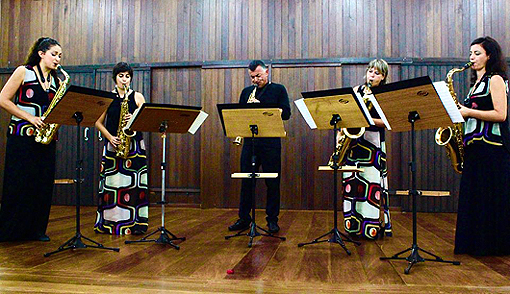 The project proposes a tribute to Latin American music through compositions by authors classical and popular of the South American tradition, such as Francisca "Ciquinha" Gonzaga, Erenesto Nazareth, Heitor Villa Lobos, Pixinguinha, Antonio Carlos Jobim, Osvaldo Pugliese, Astor Piazzolla and also compositions by Silvio Zalambani, all inspired by the Latin America countries. Amerindia Ensemble debut in 2015 performing in several music festivals and theatres: "Fiato al Brasile" (Faenza - Italy '15), "Recondite Armonie" (Brisighella - Italy '15), "Museo Archeologico" (Ferrara - Italy '15), "I Concerti a Villa Quassa" (Ispra - Italy '15), "49º Festival Musica Nova - Gilberto Méndes" (Ribeirão Preto - SP, Brazil '15).